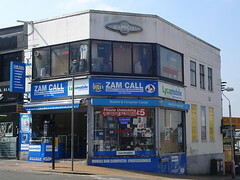 Mobile phone shop on the corner of North End and Derby Road, roughly opposite West Croydon Station. As of December 2011, a board outside advertises "2nd user phones bought and sold" as well as mobile phone repairs, while a board inside advertises watch repairs. According to a photo on Flickr, as of c. 1985 the premises were occupied by a job agency called City Centre Bureau and an accommodation agency called Accommodation Bureau Croydon. According to another photo on Flickr, as of c. 1988 City Centre Bureau was still there but the accommodation agency had been replaced by a "nail care studio" called Fingertips. See also a photo of Zam Call as of July 2012. Last edited 2019-01-08 17:11:11 (version 58; diff). List all versions. Page last edited 2019-01-08 17:11:11 (version 58).